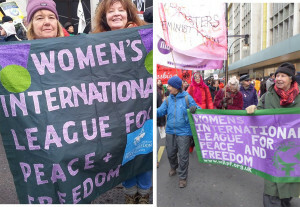 Providing inspiration for each subsequent generation of WILPF women actively pursuing peaceful solutions to global conflicts and problems, here are some of the WILPF women who have been formally commended for their peace work. Jane Adams shared the award with Nicholas Butler. She was recognised for her role in founding the Women’s International League for Peace and Freedom in 1919, and her work over the years to get the great powers to disarm and conclude peace agreements. Emily Greene Balch also shared the Prize. A sociologist, she was given the Peace Prize for her lifelong work for disarmament and peace. She studied the living conditions of workers, immigrants, minorities and women and worked with Jane Adams during World War I. In 1935, Emily Greene Balch became leader of the Women’s International League for Peace and Freedom. 1918. Awarded the Insignia of the Fifth Class of the Order of St Sava by the Serbian Government for her work with the Serbian Relief Fund during World War One. Secretary General of the Women’s International League for Peace and Freedom since 2010, Madeleine Rees received the award for her services to human rights, particularly women’s rights and international peace and security.